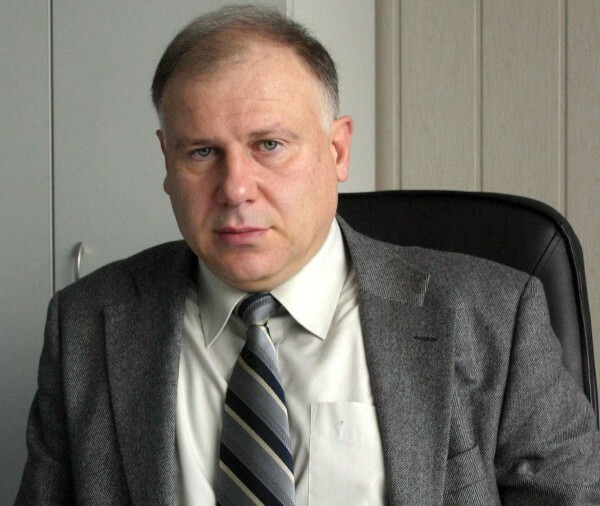 Mr. Dimitar Todorov was born on 18.04.1955 in the city of Varna, Bulgaria. He had graduated from the Technical University of Varna with a Master of Science in Marine Engineering. He had started work in Odessos Shiprepair Yard S.A, Varna in 1980 as a technologist and later he had been appointed as Head of the Mechanical shop. From 1991 to 1993 he managed the Commercial Department of the shipyard. In 1994 he had been appointed as a Commercial Director and at the end of 2003 he was elected Executive director. 1) What proportion of your business is shiprepair and what proportion conversion work? Basically, the shiprepair/conversion work ratio is around 90/10 which varies with the years. No matter that the conversion jobs are less as a ratio, we have very rich experience with any kind of conversion projects including (but not limited to) steel, piping, machinery, propulsion, re-engineering, retrofitting, etc. 2) Has it changed in the last few years and if so, how? In the last few years it has changed towards an increase of the proportion of shiprepair works and respective decrease of conversion works. 3) 2014/2015 has been some improvements in the shipping industry, but what has it been like for your yards in terms of shiprepair/ conversion work? The improvements in the shipping industry have resulted in a significant improvement in the number and amount of the repair contracts. However, the shiprepair/conversion ration remains high in favour of the shiprepair works. 4) Are you looking to diversify into any other markets, such as offshore, renewable etc? For the time being we are still devoted to the shiprepair and conversion sector. 5) What do you regard as your yard’s main (ship repair) strength? 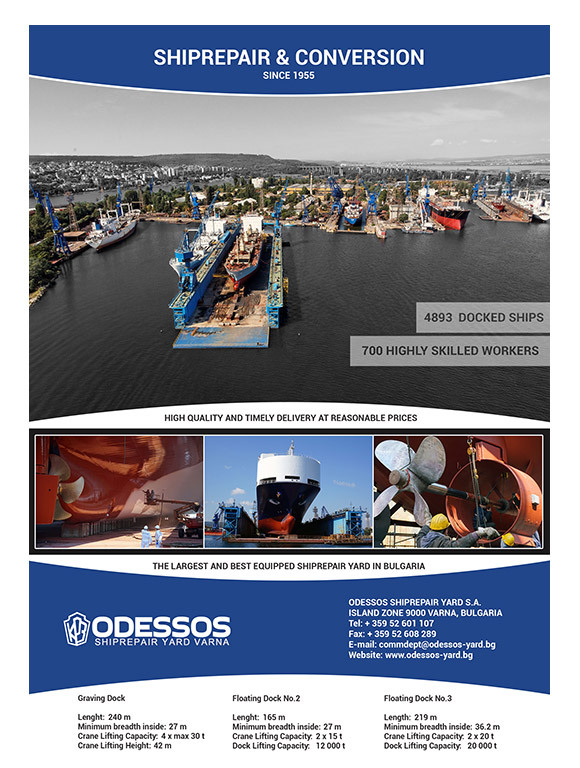 Odessos shipyard is the largest and best equipped Bulgarian shipyard for docking of vessels up to 75 000 DWT and afloat repairs up to 150 000 DWT. 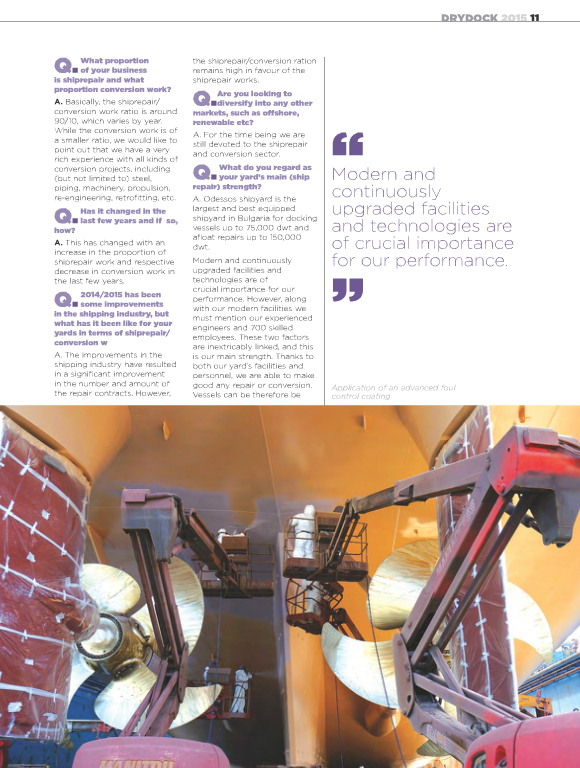 Modern and continuously upgrading facilities and technologies are of crucial importance for our performance. But along with our modern facilities we must mention our experienced engineers and 700 skilled employees. Those two factors are inextricably linked and this exactly is our main strength. Thanks to both – our yard’s facilities and personnel we are able to make good any repair or conversion so that the vessels to become seaworthy and with clear certificates in short time, within the budget limits and in optimum operating condition. Due to our 60 years experience and excellent specialists we are able to execute successful, fast and reliable repairs. High quality standards, keeping strictly to the low local price level in the region, timely deliveries and keeping to the works schedule are our advantages. Our clients say we offer best workmanship. 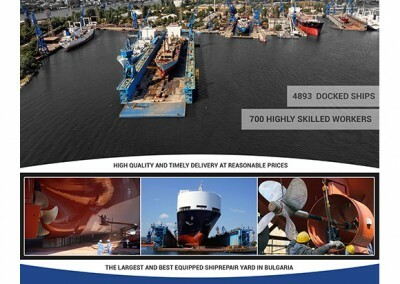 And thanks to all above, we dare to say that Odessos Shipyard is the most busiest yard in Black sea. Vulcanizer, foundry and forging area are available; both own facilities or subcontractor’s shops. Propeller repairs and reconditioning (monoblock or CPP blades) is done to highest European standards. 6) Who do you regard as your main competitors and why? 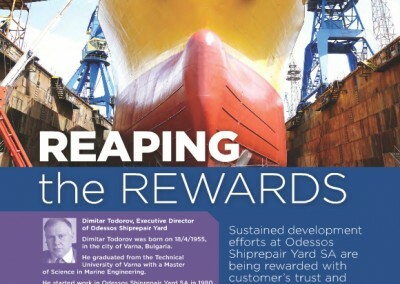 Main competitors to Odessos Shipyard are mostly located in the Black Sea and Eastern Mediterranean Sea. The relatively high number of shipyards in a relatively confined area, on one hand, and the state subsidies for some of them (Odessos excluded), on the other, make the successful establishment of Odessos a difficult task. 7) Many of today’s shipowners have modern, new sophisticated tonnage building and/or in service. How has your yard adapted/developed its services to meet these differing requirements? 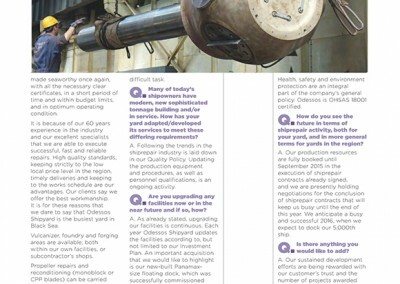 Following the trends in the shiprepair industry is laid down in our Quality Policy; updating the production equipment and procedures, as well as personnel qualification is a continuing activity. 8) Are you upgrading any facilities now or in the near future and if so, how? As already stated, upgrading our facilities is a continuing activity. 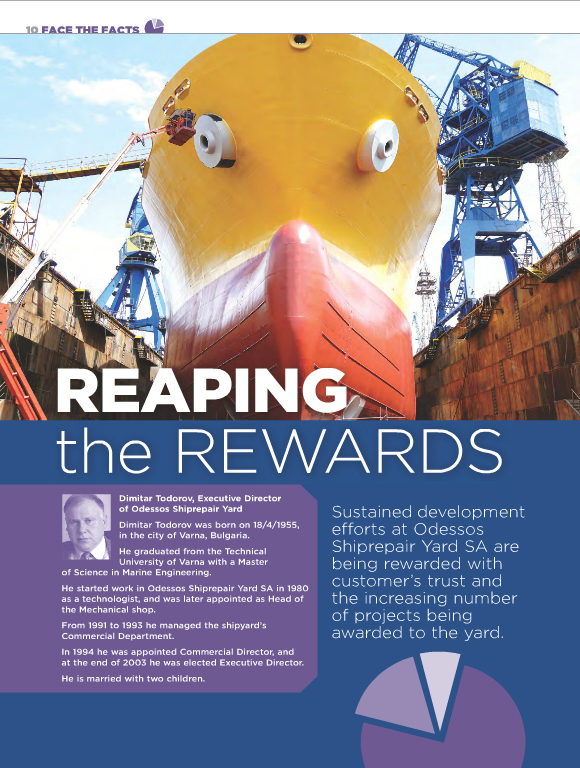 Each year Odessos Shipyard updates the facilities according to our Investment plan but not limited to. A massive acquisition we would like to point out is our new-built Panamax-size floating dock which was successfully commissioned in 2010 and is the biggest one in Bulgaria. 9) How are you improving safety? Health and safety at work is of highest priority. We try our best to provide our employees with just and favorable conditions throughout the working day. Our Medical center provides first aid in case of necessity, the Occupational health service and safety and health coordinators take care of preventive keeping the safety and our personnel’s health. Health, safety and environment protection are an integral part of the company’s general policy. Odessos is OHSAS 18001 certified. 10) How do you see the future in terms of shiprepair activity, both for your yard, and in more general terms for yards in the region? Our production resources are fully booked until September 2015 in the execution of shiprepair contracts already signed, and we are presently holding negotiations for the conclusion of shiprepair contracts that will keep us busy until the end of this year. We anticipate a busy and successful year 2016. Then we expect to dock our 5 000th ship. 11) Is there anything you would like to add? Our sustained efforts for development are rewarded with our customers trust and projects given to us. 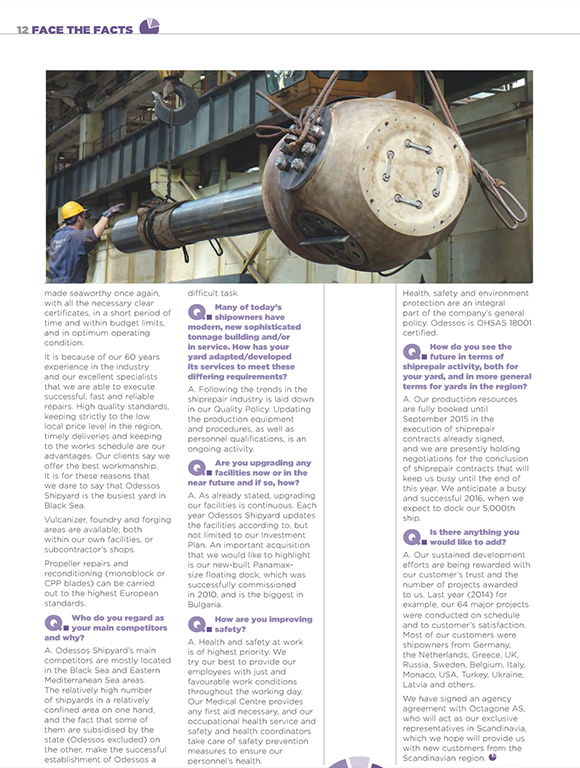 Last year, 2014, for example our 64 major projects were conducted on schedule and to customer’s satisfaction. Most of our customers were shipowners from Germany, the Netherlands, Greece,UK, Russia, Sweden, Belgium, Italy, Monaco, USA, Turkey, Ukraine, Latvia and others. We have signed an agency agreement with Messrs. Octagone AS who will act as our exclusive representatives for the territory of Scandinavia. We hope that this relationship will gain new customers for us from the Scandinavian region. Copyright © 1995 - 2017 Odessos Shiprepair Yard S.A. One of the leading shiprepair yards in the Black Sea and Eastern Mediterranean area. All Rights Reserved.